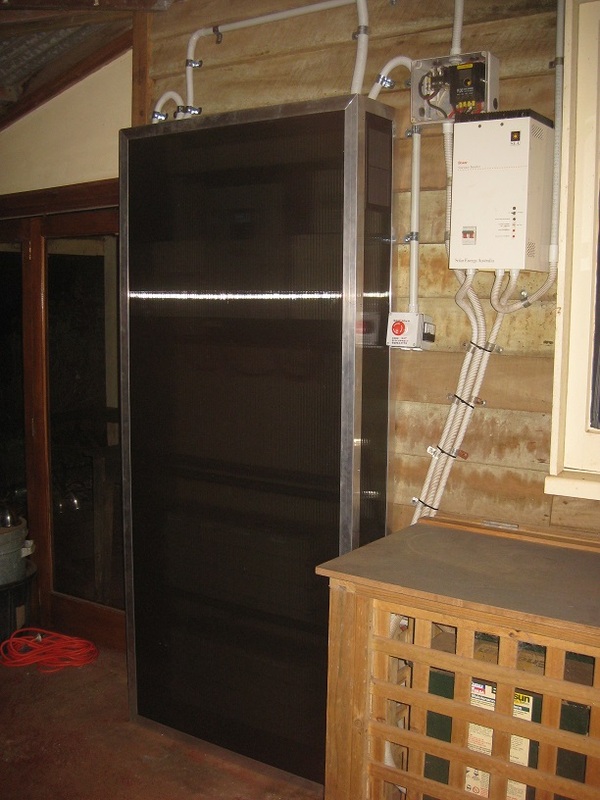 offgridQLD wrote: That charging method isn't used because we want every last drop of capacity. It's used because there is no reliable way to tell her if there is a inballance between the cells unless you charge them until you reach the upper knee and find out as they all reach that state at different times. As mentioned a few times just because you don't see cell level voltage discrepancies below the knee doesn't mean you are avoiding them or don't have them they are just hidden in the flat voltage that lifepo4 cell have over the bulk of there SOC. If the end charge terminal voltage is 3.45v x the number of cells, how much capacity out of balance can you have without a cell running away to 3.6v causing the secondary system to kick in? If you must use cell balancing then start the load dump at the cell level at 3.55v, but not on top of the cell, remote from the battery pack so the heat is not added to an already hot cell. Just because that is the easiest spot to do it doesn't mean it's the best spot, try holding one of those cell balance boards between your fingers when it's dissipating a 2 amp load as heat, what effect do you think that heat would have on cell cycle life if added to an already hot cell? "what effect do you think that heat would have on cell cycle life if added to an already hot cell?" Perhaps in a car regen braking at high current or racing up a mountain sucking 100kw from the battery they might get hot. 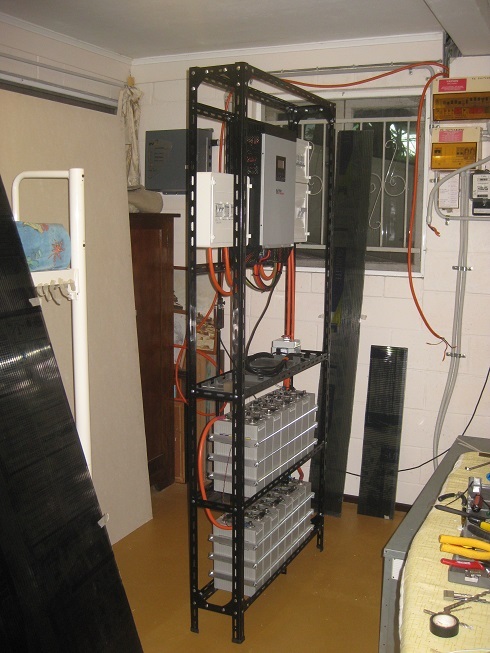 In a offgrid application with a inverter that can only consume 6000w continuous and a chager that can only charge it at 6000 - 8000w the cells would never get above ambient temperature with 0.4C max charge/discharge. Yes the on cell boards do get a little toast when shunting the full 2A for long periods.Though when they are clamped to a big aluminum cell post & 14kg of thermal mass in the cell they don't get that hot and Im sure they would have little effect on the cells temp. In day to day use they shouldn't shunt much and not for very long. Yes I agree there might not be much in the 3.55 - 3.6v range. I was under the impression you were not changing as high as that. Last edited by offgridQLD on Sat, 24 Jan 2015, 01:20, edited 1 time in total. The aim is 3.45v per cell and no cell going over 3.6v. 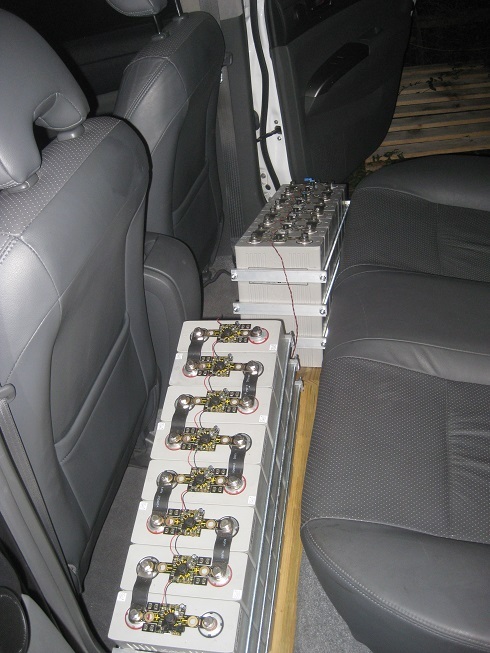 Someone might be able to provide the link to a post regarding cells being held at 3.65v with milli amps going in and balance boards attached in an attempt to balance the pack over a few days.... it was in reference to float charging I think, read through the results of that action and gauge from there if charging a cell to 3.65v gets them hot or not.... then add that heat from the balance board using the cell contents as it's heat soak, are you sure that isn't doing damage to the cell? I'd like to remind folk that this thread is about the PIP-4048MS inverter/charger/mppt, which is already somewhat off-topic for an electric vehicle forum. South facing arrays, while good to know about, are not specific to systems using the PIP, so please continue any discussion of them elsewhere. Perhaps repost the link in a separate thread in "The Lounge". 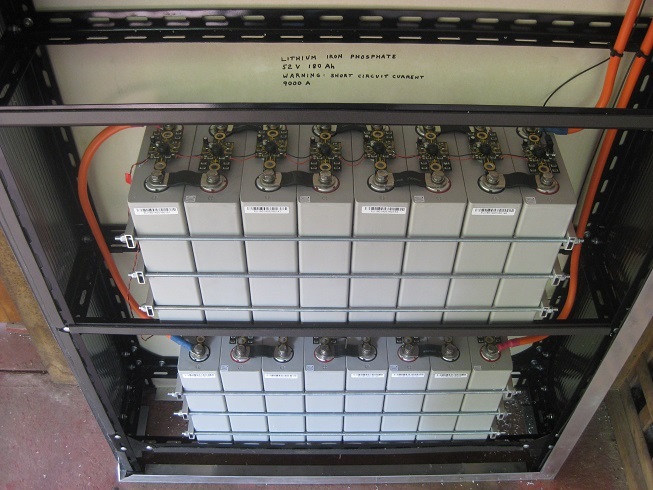 Discussions of cell balancing schemes are only relevant to this thread if they can be applied to a 48 volt battery charged by a PIP-4048MS. There is certainly more than one way to do this, and it seems to me that all three of us (Kurt, Terry and myself) know what is required, and all 3 proposed methods should work, although they are all very different. We're each working with the gear we have and the gear we know. All good stuff. I've had some brilliant help on the Monolith in the last two days. Yesterday Jeff Owen turned up unannounced, just when I needed some serious help figuring out how to attach the twinwall smoked polycarbonate sheeting and make it look decent, with stuff I could buy today. He came up with a brilliant design as usual. My friend Dr Mark Hayes helped me find everything in Bunnings this morning and my dad helped me by cutting all the polycarbonate sheets and the fibro-cement backing sheet (for fire resistance against the outside wall of the house). 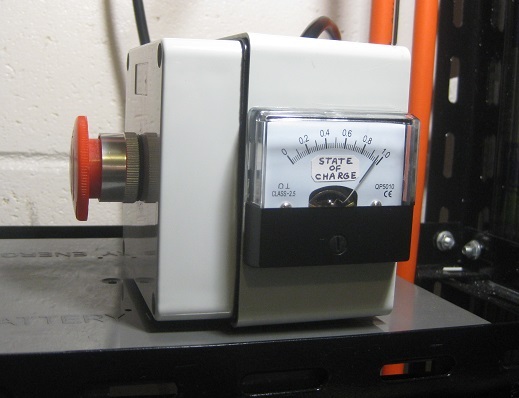 And Coulomb (Dr Mike van Emmerik) wrote the software to drive (PWM) the State-of-Charge meter you can see working below. Mike and I sure worked hard today to get the case finished. Jeff Owen phoned his apologies. Called away to a family event. What does his family think this is, Australia Day holiday or something? We didn't quite get the case finished. The plastic louvred vents for the sides and top will have to be put in on site. I had spray-painted the vents flat black, then put them out in the morning sun to harden the paint faster, then stupidly forgot all about them. When I finally remembered, they looked a bit like that Salvador Dali painting with the clocks. So I'll have to buy some more. Also, the next monolith will have the aluminium framing painted flat black too, But I ran out of time on this one. I think it looks pretty cool with the natural aluminium, but we had to be a lot more precise with our mitred corners with it not being flat black. We'll see what the customer thinks. Is it an alien artifact, or is it an open-source, Prius-transportable, tomb-stone for coal fired power. Last edited by weber on Mon, 26 Jan 2015, 19:41, edited 1 time in total. The installation went well today, although we did not get the array connected. But I'll be back out there again tomorrow. 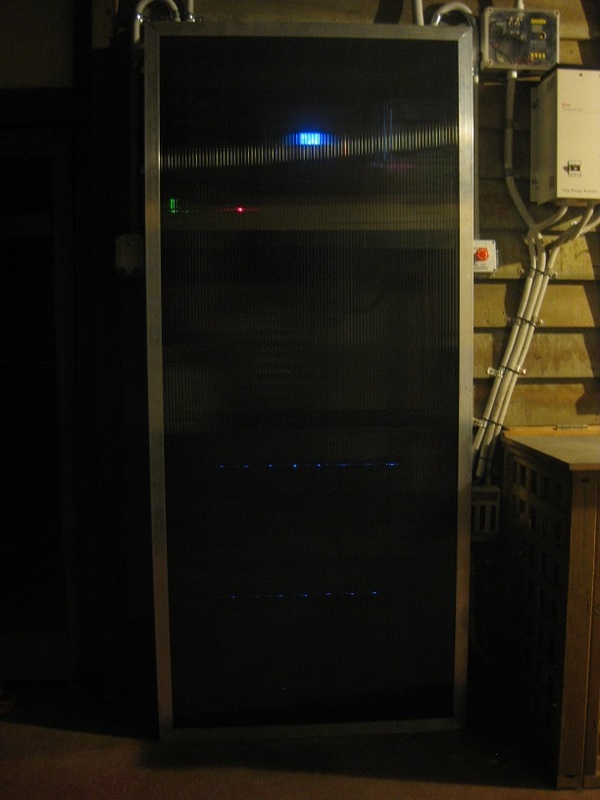 We're keeping their old existing system going, with a changeover on the AC switchboard, until we are confident we have overcome any teething problems with the monolith. You can see the old gear temporarily jammed untidily to the right of the monolith. Sorry about the poor light for the photo below. And sorry it's shut down, so there are no pretty lights shining through the smoked polycarbonate. I'll do better tomorrow. Immediately to the left of the monolith, two thirds of the way up, you can see the generator inlet, and symmetrically on the right you can see the shutdown button with the SoC meter on its side. Many thanks to all who help make this possible. so when dose the monolith worship meetings start? Who needs fancy multi drawer tool caddies with castors when you've got an ironing board? Also your cat has scary eyes. Nice job on the 'tombstone to coal fired power', we live in interesting times. Last edited by PlanB on Wed, 28 Jan 2015, 10:44, edited 1 time in total. Thanks Adverse Effect and Plan B. Your comments make me smile. So once the system is fully operational. Is it going to be fully intrusted to the new owners with installer on call if there happens to be a issue. Or will you have remote access to the PIP online to keep tabs on it. I know a lot of installers have remote access to there clients systems for the odd check up. Ps, My 400ah calbs have been no fuss at all and performing beautifully .Very happy with the upgrade from lead acid. Last edited by offgridQLD on Thu, 29 Jan 2015, 05:24, edited 1 time in total. The old and the new. The old lead-acid system on the right. The new lithium system on the left. At night, without the camera flash, so you can see the internal lights. 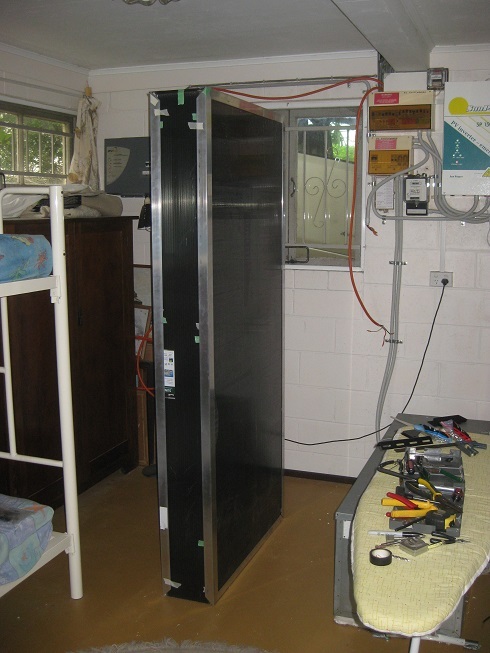 The top of the monolith, showing the two vents above the PIP's MPPT heatsink, and the conduit entries which are (left to right) generator in, AC out, PV array in, and shut-down button and SoC-meter. 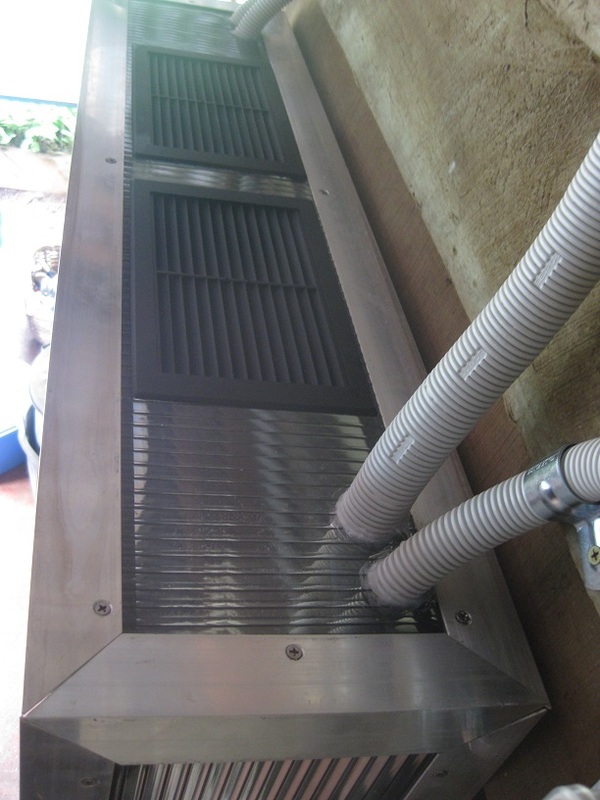 The next two photos show the three vents being fitted to a side. Both sides are the same. After the "Salvador Dali" fiasco, I have cleaned out 5 Bunnings stores of the dark brown version of these vents, which I spray-paint flat black. In fact I settled for using one white one and it appears in the photos in this post. Can you pick it? No, but you might in a few years time if some paint gets rubbed off. So you can guess where I put it. I've placed them in reverse chronological order because that way they happen to also make a (poor) cross-eyed stereo pair. Use Ctrl+minus to reduce them in size. Last edited by weber on Fri, 29 Apr 2016, 19:45, edited 1 time in total. All aspects of the monolith design, aesthetic, structural, electrical, electronic and software, are open-source. Steal this idea. 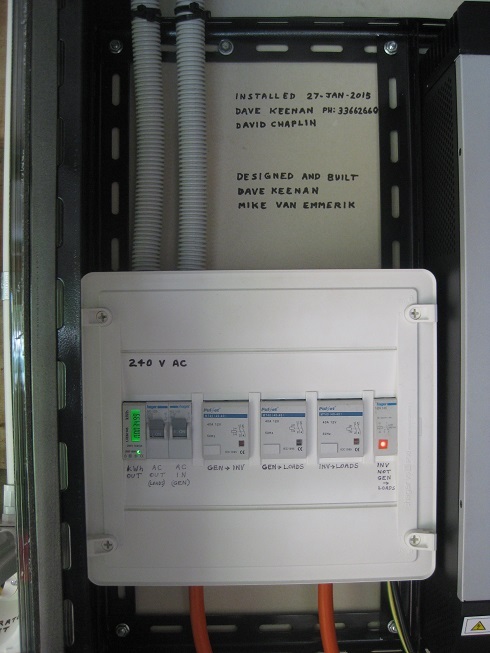 Just make sure you steal it properly, as there are significant safety issues relating to fire and electric shock. Let me know what aspects you want documented. I have designed it, to the best of my knowledge, to meet the current versions of AS3000, AS4509, AS5033 and AS4086, but it is up to you to verify its safety and suitability for your own purposes. 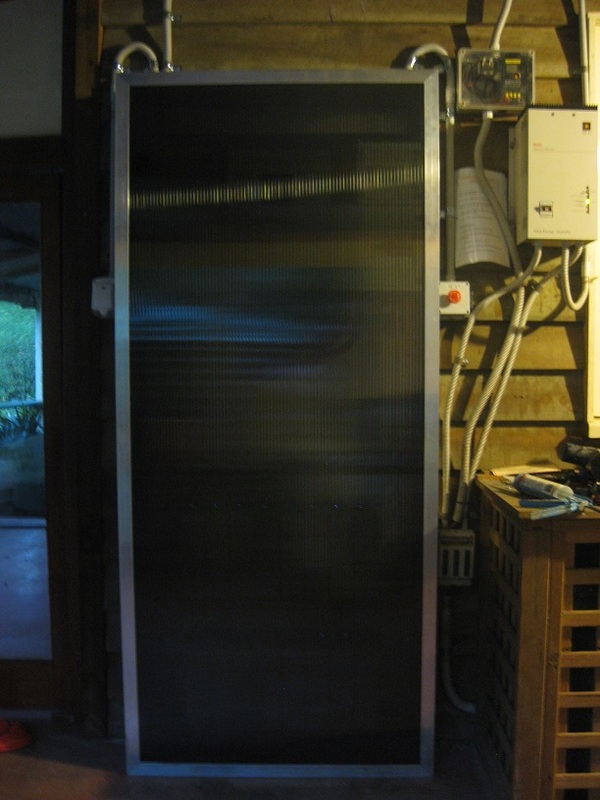 Of course the big question-mark hanging over it is how robust, reliable and long-lived is the PIP-4048MS inverter/charger that is the monolith's heart. Only time will tell. Apart from myself, the greatest contributor to this project, by far, was Dr Mike Van Emmerik (Coulomb) for electronics, software and construction help, and for always responding to my innumerable ravings via email, despite having a full time job and a family. At least this Weber & Coulomb project only took 3 months, not 5 years. But of course we have re-purposed, as the monolith's nervous system and brain, the (open-source) BMS we developed for the MX-5, which took up so much of those 5 years. Also deserving of special mention are David Chaplin for electrical design advice, construction help and installation help, Greg Breslin and my father David Keenan for construction help, Trevor Berrill for control-system design advice, and Jeff Owen for saving my arse when I discovered, with 2 days to go to the second scheduled installation date, that my ideas about neatly cutting and solvent-welding the twinwall polycarbonate were the purest fantasy. Also Mike (again) for saving my arse by debugging-extraordinaire, and by implementing a state-of-charge meter with one day to go. And all of the above for visiting and giving me the benefit of their intelligent company on what is otherwise lonely, and therefore hard to motivate, work. Also my wife Janelle who has been a "monolith widow" and taken care of my household chores as I battled with the control software development and testing for the past month or so. Also "the customer" (who shall remain nameless for security and privacy reasons) who was willing to take a risk on something that he knew only existed in my mind, and who paid 50% in advance, which made its development possible, and who put up with all the schedule-slips with great patience (well OK, perhaps he got a teensy bit concerned towards the end). 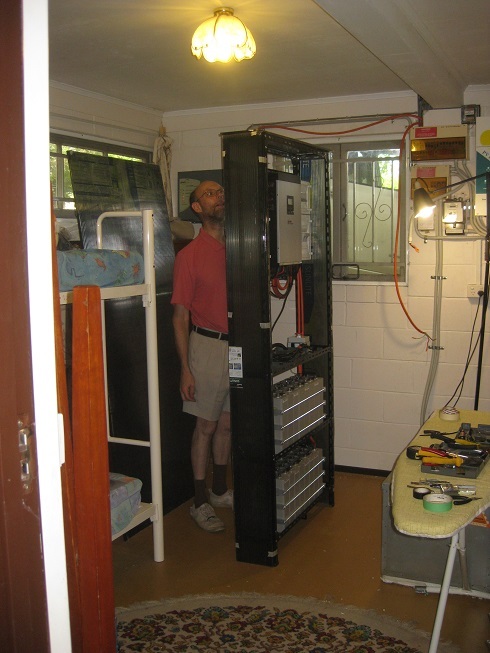 And thanks to my former lead-acid system customers Gordon and Hanneke, Vicki and Maurice who must have given me a pretty good rap for "the customer" to be willing to take this risk, and to Gordon (again) and his African visitor Younus for installing most of the PV array. And I want to thank all you folk who have helped me with valuable advice and discussion on this forum. Kurt (offgridQLD), Johny, T1 Terry, Kris (PlanB), Adverse Effects, 7Circle, celectric, antiscab and neilg. Also Arthur C Clarke and Stanley Kubrik. And in case you haven't had enough monolith photos, here are some full-frontal nudes. Note the fibre-cement backing sheet for fire retardancy, and polycarbonate is one of the least flammable plastics (490°C ignition and self-extinguishing when external flame is removed). 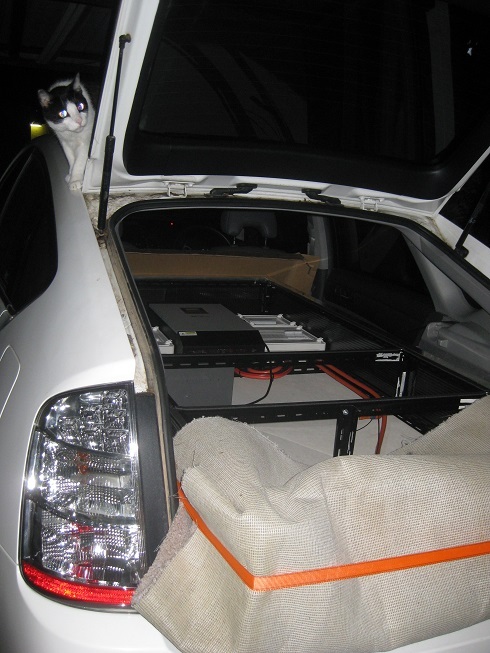 When I first had the idea for a lithium-based standalone power system in a smoked polycarbonate monolith, months before "the customer" appeared, I described it to Mike in email and asked, "Is this a crazy idea?". He replied: "Of course. But all great projects start that way, I suspect." Last edited by weber on Thu, 05 Feb 2015, 10:15, edited 1 time in total. Here's the user manual for the Monolith. As you can probably gather from the 3 page user manual above, it's entrusted to the owner, with me on-call for any problems -- actually on-email (from the customer's work location) unless it's an emergency. I'll certainly let you all know how it goes. So far, no news is good news. Remote monitoring, and the ability to remotely update the software would be nice. 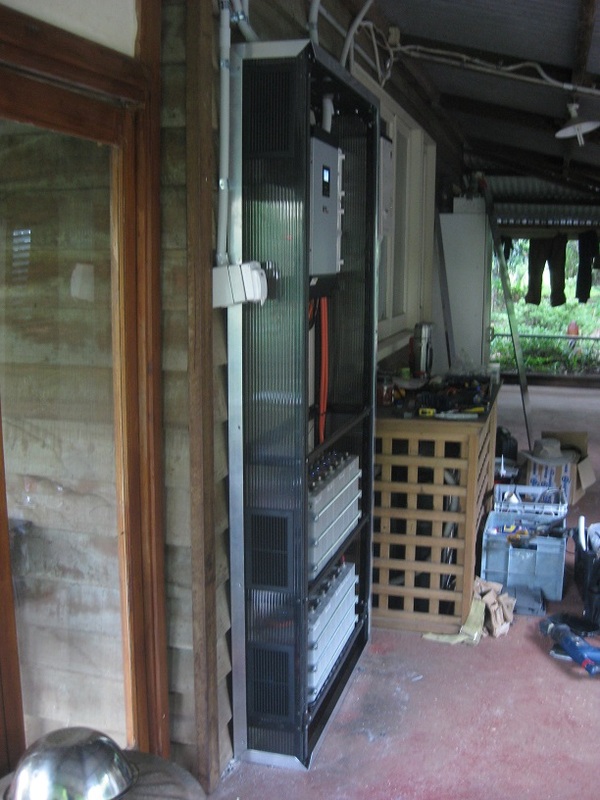 But it would be a lot of additional design effort and the customer has poor mobile phone access (you have to climb on his roof) and the landline is not likely to be amenable to ADSL (a very long way from the exchange) and they have not installed satellite internet. Maybe PlanB, who is handy with a RaspberryPi, can get this aspect working. Incredible job Weber. I have watched with interest as the monolith developed and I think it it's a wonder to behold. 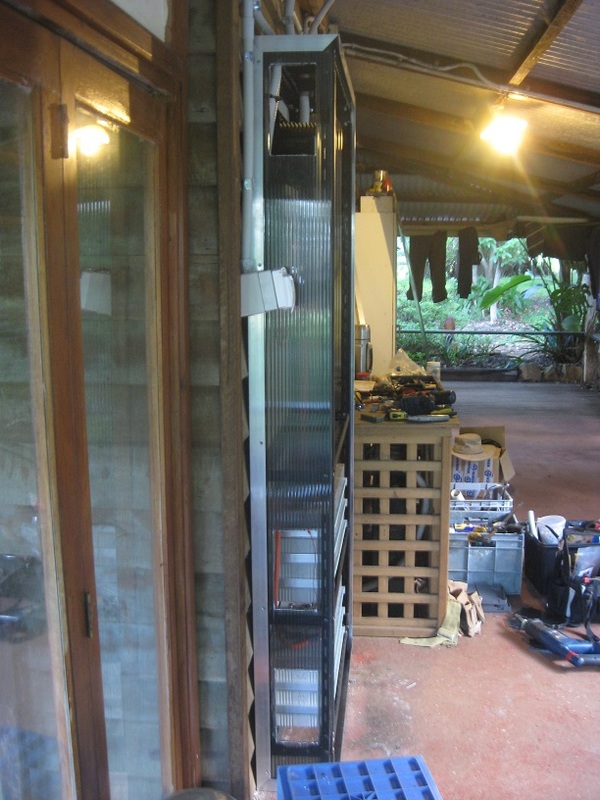 I have plans for an off grid system to sit side by side (metaphorically) our grid tied system and hope to tap into your knowledge and development when I finally get the bickies to go ahead. I know people are interested in the cost. So here's the original quote for this customer, verbatim. 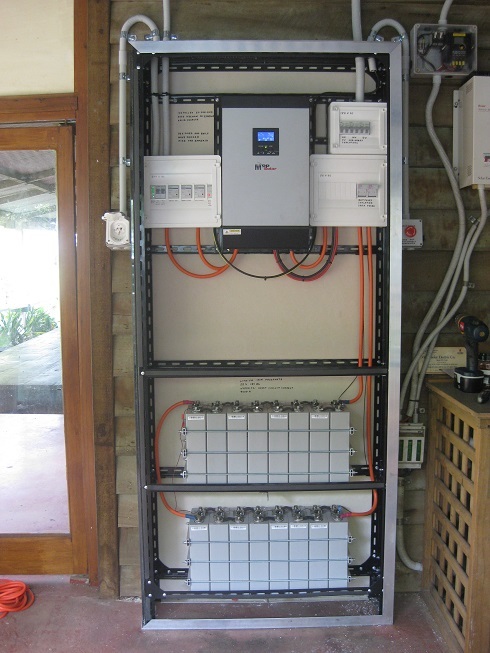 I note that while this system has only half the monolith's design battery capacity (because it is for a frugal off-grid household of only two people), it has just over the maximum non-clipping PV array power for a single PIP-4048MS inverter, because the location has massive shading problems that the customer was unwilling to address, for quite valid reasons of aesthetics and thermal comfort. I will provide a 5 year warranty on the whole system. 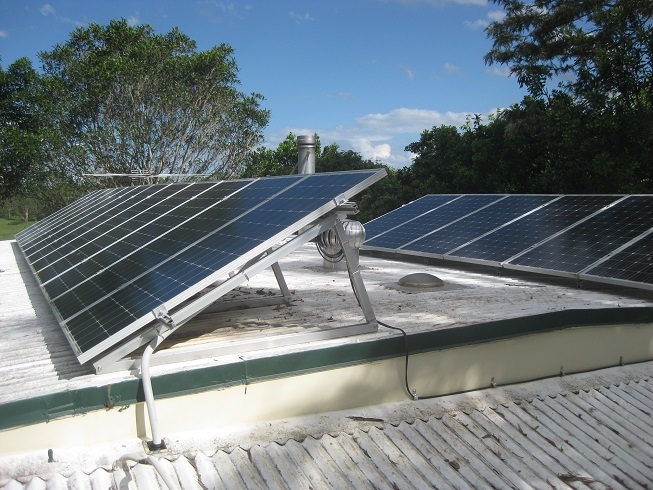 In addition, the manufacturer of the PV modules (solar panels) gives the usual 25 year warranty for 80% of original capacity, as you can read in the datasheet below. I have listed Winston Battery but I may instead use cells made by CALB or Sinopoly if they can get them to me sooner. These have slightly higher capacity, but I would charge you the same price. In fact I supplied CALB cells because Rod Dilkes (EVPower, WA), who always responded to my emails the same day, actually had them in stock in Australia, and because I suspect they might be higher quality than the others (we're happy with their "Sky Energy" brand precursors in the MX-5), and because the Winston 160 Ah cells don't actually fit the monolith shelves. Apparently they changed them from 183 mm wide to 210 mm wide in 2010. But I should have charged more for the CALBs. Sinopoly were a dead loss. Sinopoly China took a week to respond to my email request for either a quote or contact details for an Australian agent, and then when they passed my quote request on to this supposed agent (Cain Dixon of Enerdrive), and also when I emailed him direct, I got no response whatsoever. Zero, zilch, zip, nada. Because the PIP-4048MS is such an unknown, I factored in the possibility of having to replace it once within my 5 year warranty period. Its manufacturer only gives a 1 year warranty. This is the biggest risk of the whole quote since replacing it with a known reliable brand such as a Selectronic SP Pro plus separate MPPT charge controller, would cost around $7000. And of course the labour charge does not include all the design, research and development work, as I wished to retain all the IP rights and open-source them, since I figure this is my best way of contributing, in the war that those psychopathic artificial intelligences, the fossil fuel corporations, and their puppets in government, have declared against us all, and against the planet. And perhaps more importantly, when you know I'm contributing for free, Coulomb, and all you other wonderful people are happy to contribute for free. That sort of willing co-operation brings tears to my eyes. Last edited by weber on Sun, 28 Jun 2015, 09:25, edited 1 time in total. You may have noticed, I wrote inside the monolith, "Warning short circuit current: 9000 A". This is [Edit: possibly] wrong. It was the result of a sloppy mental calculation on site, at the end of a long day. It's "only" about 3500 A, or 20C, by extrapolation from measurements of droop under load, which give an internal resistance for each 180 Ah cell of about 1 milliohm. It's a shame the battery manufacturers don't give this figure. It's important for sizing the unprotected part of the battery cable and the links. That is, the part of battery circuit up to the fuses. The standards require this to withstand a 1 second short circuit without compromising the insulation. With common 90° PVC insulation this requires about 1 mm^2 of copper for every 100 A of short circuit current. The monolith uses 35 mm^2 battery cable with a 100 A fuse in both legs (as no leg is earthed). Last edited by weber on Sat, 07 Feb 2015, 10:01, edited 1 time in total. "The monolith uses 35 mm^2 battery cable with a 100 A fuse in both legs (as no leg is earthed)." I used 95mm2 for the calb 400ah up to the 250A fuses. Great example of the awesome power potential in a single calb 180 grey cell when (essentially) shorted giving 2200A for a 20mm spanner. Last edited by offgridQLD on Mon, 02 Feb 2015, 13:40, edited 1 time in total. T1 Terry wrote: I was thinking the 9,000 amps was a little under rated actually, the initial short circuit current would be higher than 20C before the load starts to drag the current down wouldn't it? When I extrapolate from Damien Maguire's excellent experiments (thanks Kurt) I get a short-circuit current of around 6900 A or 39C for the 180 Ah grey CALB. This is because the cell terminal voltage droops instantly from 3.33 V to 2.35 V (a droop of 0.98 V) at a current of 2050 A, so that's 0.98 V / 2050 A = 0.48 milliohms, and 3.33 V / 0.48 mR = 6900 A.
I'm guessing that by extrapolating from the droop I measured with only tens of amps, I was ignoring the pretty-much-instantaneous heating of the electrolyte that would happen with a much higher current. So with a real short circuit, say 0.05 mR (Damien's spanners are nowhere near a short circuit when applied to a single cell) it might drop the internal resistance even further and peak at 9000 A or more. Or it might boil the electrolyte and thereby raise the internal resistance so the current doesn't get much above the 2050 A. We won't know until someone actually does it. Should be the manufacturer. In any case, it looks like I need to double up my unfused cable, or I could add another 100 A fuse, bolted inline, in the cable at the middle of the battery -- the one that goes between rows on the left side -- so there effectively is no unfused cable. I note that a real short circuit, on a single cell, won't get anywhere near as hot as Damien's spanners. Most of the heat will be dissipated inside the cell itself, and will certainly damage it. It's also not an instant flash and it's all over, the single cell short circuit tests continue to smoke the double conductor 2/0 cables for 10 mins in the You Tube videos, and that is only at 3.2v nominal. I wasn't saying the short circuit current would only last 1 second. That's just what the insulation on the unfused part of the cable has to withstand according to the standards. A short can only happen during installation or maintenance because at other times the terminals should be inaccessible, needing a tool or a key to access them. If it goes on for 10 minutes, i.e. 1/6 of an hour, then by definition it can't be more than 6C (1080 A for a 180 Ah cell). Sorry to preach, but people's attention will always wander. That's why we should only use insulated tools. It doesn't take long to wrap a spanner in a double layer of electrical tape. The fuse in the pack linking cables is probably the best solution, even if it's 500 amp mega fuse as it's only intended to protect against a catastrophe, not as service protection device. 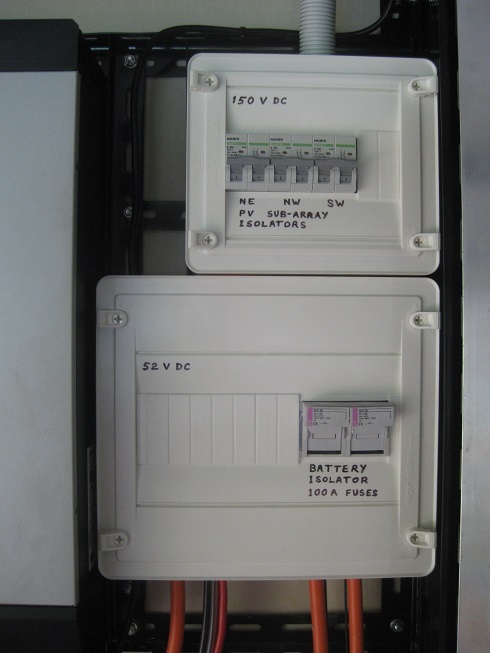 Blueseas make a fused terminal contact that would suit such a purpose as well https://www.12volt.com.au/redirect.html?a=/General Htmls/webcat2003/breakers.html about 1/3 way down the page.